Former England fly-half Paul Grayson says Eddie Jones' side didn't show up against France, after Six Nations defeat in Paris. 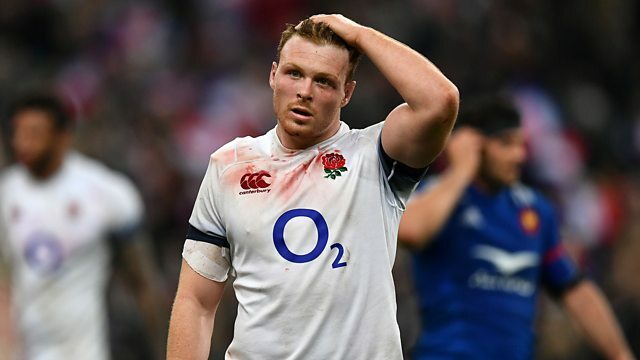 England fell to a second defeat in two matches, whilst Ireland's bonus-point win over Scotland meant they secured the Six Nations title. Grayson said: "They are the second best team in the world, they were lucky to be the second best team in Paris today. "With a couple of injuries all be it, England have been found out in the breakdown." World-Cup winning scrum-half, Matt Dawson added: "France and England being in the same World Cup group is going to be very tasty!" England next face Ireland at Twickenham, who are now one win away from completing a Grand Slam. This clip is originally from 5 live Sport, 10 March 2018.